Oberthur Technologies announced its 1 millionth PIN deployment. 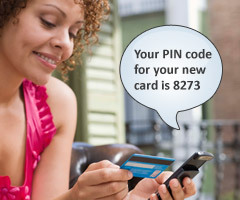 The PIN by SMS service launched in 2010 and simply transmits a PIN code to a cardholder via SMS message. Oberthur’s issuance method provides card issuers with a quicker, safer and more efficient means of PIN transmission when compared to traditional paper mail, saving money in handling, printing and postage. As an added security measure, the card issuers can also track the progress of the PIN request, ensuring successful delivery. In addition to the company’s SMS method, Oberthur also transmits PINs using Interactive Voice Response (IVR) or Internet to support a host of applications including first PIN issuance, re-issuance of a PIN, PIN selection and card activation.